I feel like I spent most of last year complaining about the weather. In my defense, it wasn’t just my imagination- it was our wettest year ever on record. Although the wet weather pattern was predicted to continue through winter, so far this January has been nothing short of awesome. Thank you Texas, because I was about to lose my damn mind. That’s not to say that we’re dry… we’ve been so saturated with rain that I’m pretty sure we will never be truly dry ever again, but at least we’ve been able to ride for more than a couple days at a time. It’s glorious. 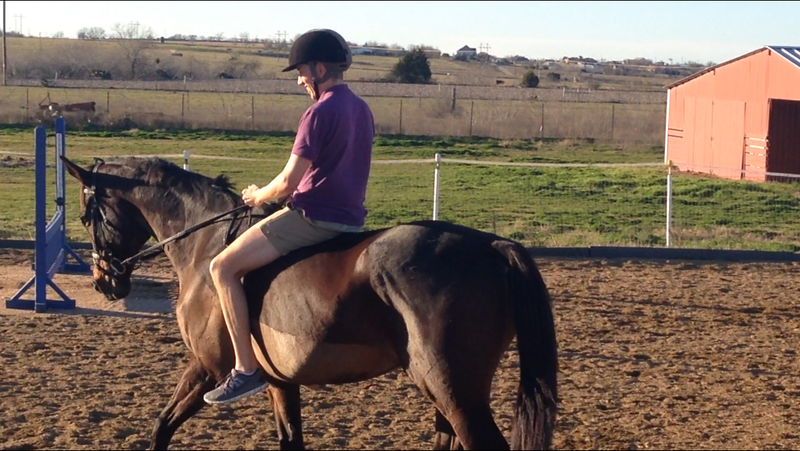 You can even ride in shorts, if you’re Bobby. 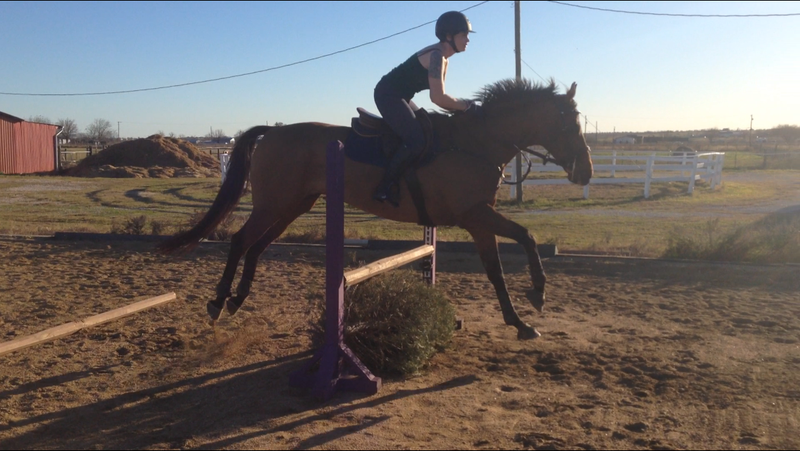 Last week I stole my neighbor’s Christmas tree so that I could take it to the barn and use it as jump filler. Henry was not impressed in the least (are you jealous of his ability to take off and land at the same time? mad skills.) but I’m totally down with the fact that I’m jumping a Christmas tree in January in a tank top. Someone remind me of this next month when it starts raining again. Its been crazy rainy here in SC. The ground is so saturated I’m not sure the trails will ever dry out. December was amazingly warm though and honestly 70 and rainy is better than the 18 and dry we have had this week. Nothing is ever perfect I suppose. It makes me miss the indoor arenas up north something fierce. This makes me want to weep. Current temp here in Maryland is 15 deg, with a real feel of 0 deg 😦 And all of our mud is now frozen into the worst footing imaginable. Let me say this in the nicest possible way. In all fairness, we were flooded basically all year. Fair enough. And thus endeth the complaining from me! We are under a blizzard warning for this weekend. I’m SO EXCITED!! AAAAHHHH FINALLY REAL WINTER OMG WHERE HAS THE COLD BEEN BRING IT ON!!!! Send the moisture to Alberta please ! It is winter, I want snow, or winter can kindly go away now! 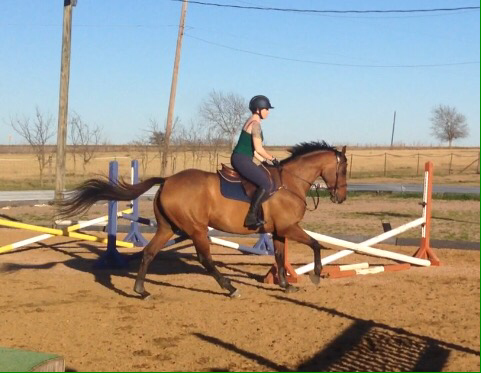 Also, very jealous of the riding in tank tops in January. It was 50 and sunny here yesterday. I almost busted out a tank top. I think 6″ of snow tomorrow though. Lucky lucky. We got our first snow of the year on Sunday, and a storm is supposed to hit us on Friday. Ya wanna know how Monday-Thursday is? Highs barely past 30. Fortunately, you can jump a Christmas tree in either weather (except the storm, not gonna recommend that). So jealous of the weather there. I feel like I’ve complained a lot about it this year, too, because it’s been either Hot, or Cold&Soggy this year. It dropped to 31 here in N Florida last night and I think people think the world froze over, lol. I would literally take wetness over 3*. Nothing can be done in the severe cold (B got a nosebleed yesterday doing very mild work in 9* weather..UGH!) and I’m losing so many good days! I think rain is crippling for us the way that cold is crippling for you. Our soil has very high clay content, so it’s very slippery and unsafe when it’s wet. No riding, no turnout. I’d trade an appendage or two for some sandy loam. It was -6C this lunchtime when I turned the ponehs out this afternoon. I was afraid to check the temps when I brought them back in this evening. But the ground is rock hard! ugh jealous. i just signed up for a clinic at the end of the month then legitimately worried whether we’d be able to ride more than once or twice a week before then… we’ll see, i guess? Hahaha welcome to how our entire 2015 went! We went to a lot of shows having not ridden for a while beforehand. That looks absolutely amazing! We’ve just had at a week of -20* weather. Thank god for heated barns but I miss trail rides! This is hilarious to me, because the high tomorrow is 57 and I’m like “Oh brrrrrr cold day”.